Jochen Benzinger is considered one of the world's best watch artisans for engraving, guilloche dials and skeletonized movements. Jochen, who both lives and works near the Black Forest region of Germany, creates masterpieces from movements, with all of his work done completely by hand using machines that in many cases are over 100 years old. Jochen was born in 1961, and under the guidance of a guild master in Pforzheim he completed his apprenticeship in engraving, finishing and earned a diploma for being among the most talented students. Looking for a new challenge, he taught himself the craft of engine turning, which today is no longer offered as an apprenticeship. To learn these tasks, Jochen not only had to rely on the talents of elderly specialists still living in Pforzheim, but also had to buy and restore the original engine turning machines. In 1985, Jochen took over the company Kollmar, which had established itself for five generations as one of the most reputable engine turning workshops. WatchBuys is both honored and extremely pleased to have Jochen Benzinger as partner as we feature watches under his name (it's about time the credit should go to the creator). Jochen himself is quite modest, but we know him personally, and have visited his workshops on a number of occasions. Inside, you'll find projects that he's working on for the finest watch brands in the world, in some cases where the total cost of the watch will be in excess of $100,000. We can't mention many of the watch brands we've seen during our visits, but the next time you see hand engraving or a hand guilloche dial on a very expensive watch, Jochen Benzinger could be involved. 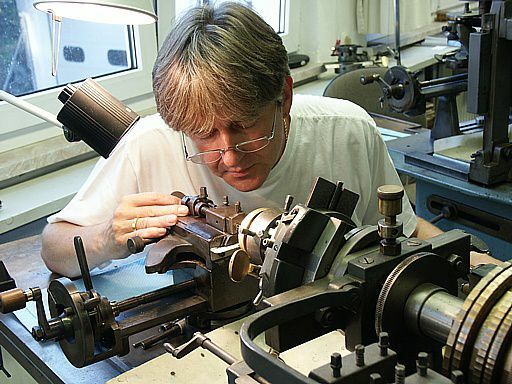 Jochen is also responsible for the hand engraving of the internationally renowned and collected gold Faberge eggs. If you are looking for a very special watch, created in the tradition of craftsmen that made Pforzheim famous in the 1800's and early 1900's, Jochen Benzinger is a real artist. Your watch will have been skeletonized and engraved by hand. The dial will have been guilloched on an original engine turning machine, line by line. No stamping, no computer machines, no copies. Jochen employs a team of skilled watchmakers and craftsmen who work with him to create his masterpieces. This team includes master watchmaker Hermann Grieb, who works with Jochen on the BenzingerONE collection. To see our collection of Jochen Benzinger watches, please click here.